City Park01274 433678work ParkCity park is Bradford's brilliant multi-award winning public space. The Mirror Pool is the largest urban water feature in the UK. It can be a cool, tranquil and misty space, a huge reflective watery mirror, a bubbling, squirting, popping and splashing fountain display, a beautifully lit aqueous light display or a thunderous 100ft water canon. City Park's computer plays 100 fountains, laser lights, mist and water effects like a maestro conducting a glorious watery symphony. Afternoons are best if you would like to see the Mirror Pool full, dusk is best for viewing the lights. Make use of City Park's free WiFi and follow us on Facebook and Twitter. 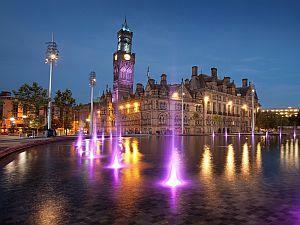 City park is Bradford's brilliant multi-award winning public space. The Mirror Pool is the largest urban water feature in the UK. Please note:high winds or freezing temperatures can affect City Park's operations. * Some events may be chargeable.